69 years, 10 months, 12 days old age. 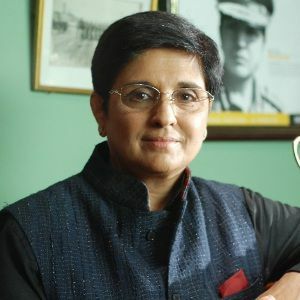 Kiran Bedi will turn 70 on 09 June, 2019. Only 1 months, 18 days, 10 hours, 21 minutes has left for her next birthday. Kiran Bedi has celebrated the total number of 69 birthdays till date. See the analysis by days count and bar graph. Kiran Bedi was born on 09-06-1949 in Amritsar in the state of Punjab, India. She is an Indian IPS Officer, Activist, Tennis Player, Politician & Author. Kiran Bedi is the first woman to enter the Indian Police Services. She is a retired IPS Officer, former tennis player, politician and social activist. She is currently Puducherry's Lieutenant Governor. She took voluntary retirement in 2007 after giving services to police in 35 years as Bureau of Police Research and Development. In 1966 she became the national junior tennis champion and won many different titles and state level and national championships. She served in Delhi, Goa, Chandigarh, and Mizoram. In 1979 she won presidents police medal. She launched Navjyoti India Foundation against drug abuse. She is the second child of Prakash Lal and Prem Lata including her three sisters. She started her elementary schooling in Sacred Heart Convent School. After 9th standard, she joined Cambridge College to study science. She did B.A. Honours in English and did master’s in Political Science. In 1988, she obtained the law degree at IIT Delhi. After training at Mount Abu in Rajasthan with 80 men she became first woman IPS officer. Her first posting was in Chanakyapuri, Delhi. She was very strict and determined and crimes almost came to an end in her region. There are many documentaries and biographies based on her like Kartavyam, Doing Time, Kannada Kiran Bedi and Dare! Kiran Bedi. She received many awards and reorganizations in her lifetime including Cadet Officer Award, President’s place Medal, Asia Region Award, Lion of the Year, Pride of India, IIT Delhi Alumni Award, United Nations Medal, Most Admired Woman in the Country and Nomura Award.